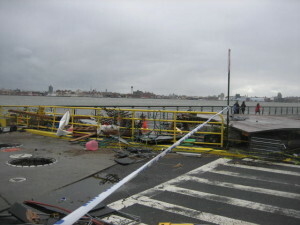 In October 2012 Hurricane Sandy roared into New York City leaving a trail of destruction throughout the region and the city. 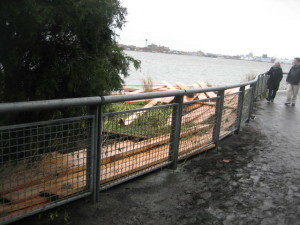 In Stuyvesant Cove Park plant beds were destroyed, soil and mulch were washed away and the performance stage was reduced to a pile of rubble. Thanks in part to funds from the Stuyvesant Cove Park Association, the team at Solar 1, joined by our Park Angels and other members of our caring community, were able to restore the park. Hurricane Sandy, with all its devastation, served to reinforce the need for The East Side Coastal Resiliency Project. Using a combination of flood walls, deployable barriers and berms, the project seeks to make changes to the construction and landscaping of waterfront locations so that they are better situated to prevent, or at least better survive, the effects of a future storm surge. The plan has undergone a number of changes, many of which resulted from comments received at community meetings. Click here for the most recent plan update.